Sooty grouse are popularly known in Southeast Alaska as hooters because of their deep, hooting call and are one of North America's largest grouse. The male sooty grouse, tipping the scales at 3 pounds, is a handsome bird, with its yellow comb standing out against the slaty blue of the head, and with its long black tail tipped with pale gray. The females are browner than the males, and are slightly more than two-thirds their size. The largest upland game bird in Alaska, this grouse can be distinguished not only by its large size but also by the pale band of gray on the tip of its otherwise blackish tail. In spring, the skin on each side of the male's neck develops a deep yellow air sac that becomes encircled with a frill of white feathers when inflated. These air sacs produce the “hoot” of the male, a ventriloquial call sometimes heard over a mile away. The sooty grouse was formerly known as the blue grouse. The American Ornithologists’ Union (AOU) recently split the blue grouse into two separate species, sooty grouse and dusky grouse – these former subspecies groups are now full species. Dusky grouse are found in the interior western U.S. and Canada, while sooty grouse are found along the coast from Southeast Alaska south to northern California. Nests are almost always outside male territories. Hens usually lay five to nine eggs in a shallow depression scratched out in the forest floor. Most nests have overhead cover of small conifers, shrubs, rock overhangs, or logs, but in old-growth forest may be at the base of a large tree. Males do not assist females and remain alone within their territories through the summer. In late June, sooty grouse hens with their downy chicks frequent the edges of muskegs, logged areas, and roads. In August and September, deer and goat hunters begin to see families of sooty grouse, with the chicks well grown, in the alpine meadows near timberline, almost in ptarmigan country. By November birds move onto winter range at slightly lower elevations in. Males may remain alone or form into small groups of three to six birds. Females with their broods often form into small flocks of up to 10 (occasionally to 20) birds. Many people have heard the "boy-with-the-empty-cider-jug" hooting of sooty grouse that begins soon after mid-March, when the males are concentrated in the upper half of the timbered zone of the mountains. Although the calls are loud and resonant, they can be quite difficult to pinpoint. As hens begin incubation in the spring, the males gather into small flocks. In fall, these flocks disband and the males join the hens and broods. In winter, the birds spend most of their time in coniferous trees where the winter diet of hemlock and spruce needles is obtained. Sooty grouse eat many berries in August and September, as well as other vegetation, but soon afterward change to a diet of conifer needles. Sitka spruce and both western and mountain hemlock provide most of the food of these grouse until May, when fresh growth again is available. The adaptability of the digestive tract of these grouse is amazing, considering the rapid change in fall from a succulent diet of berries to the dry, fibrous fare of evergreen needles. There is a tremendous seasonal turnover in the kinds of bacteria in the intestines that do most of the conversion of incoming food to usable nutrients. Insects, caterpillars and other forms of protein are particularly important to chicks in the spring and early summer, and the birds’ diet becomes more vegetarian as it matures. 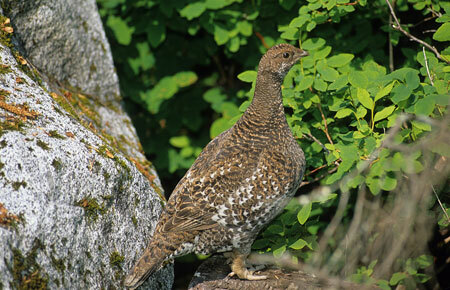 The wet, evergreen forests of Southeast Alaska from Haines to Ketchikan are the home of the sooty grouse. Practically every island and cape has a population of these birds, with the exception of Prince of Wales Island. Large mature conifer sare important to sooty grouse, as it provides food and shelter in the winter months. Muskegs and alpine meadows are equally essential for the superior summer and fall feeding areas they offer. Hens with their chicks seem particularly fond of sunlit forest edges. 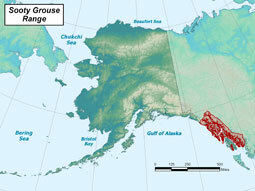 Abundance of Alaska game birds varies widely over the years, but rarely are these fluctuations in the classic “10-year cycle.” The sooty grouse of southeastern Alaska (and the spruce grouse of coastal areas) apparently never drop to low levels like the spruce, ruffed, and sharp-tailed grouse of Interior Alaska. Causes of the fluctuations are not understood but may involve recurrent changes in climate, food and cover conditions, predator abundance (which can be related to snowshoe hare cycles), or genetic makeup of the bird populations. Cold wet springs can cause high mortality in young birds. Heavy hunting pressure is never exerted over a large enough area to be responsible for the widespread changes. Extensive clear-cut logging of old-growth forest in Southeast Alaska has resulted in lower sooty grouse densities in those areas. The introduction of marten onto Baranof Island has also had a negative effect on sooty grouse numbers there.